From juicy tomatoes to abundant seafood and iconic citrus fruits, Florida farmers grow everything under the sun. The state boasts 48,000 farms spread across 9.5 million acres. In 2012, the state’s agricultural cash receipts totaled an impressive $8.22 billion. Many Florida growers supply the U.S. and the world with fresh produce, as the state’s top crops include grapefruit, oranges, sugarcane, bell peppers, fresh market tomatoes, snap beans, squash and sweet corn. In fact, the state ranks second in the nation for vegetable production, only behind California, and is responsible for 63 percent of the nation’s total citrus production. The state is also No. 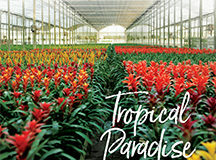 2 in the U.S. for production of greenhouse and nursery products. More than just produce, Florida is a major player in livestock production, ranking 12th in the nation for beef cows and 18th in total cattle, as well as forestry, field crops and agricultural exports. 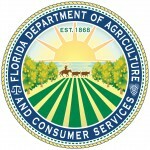 In 2012, Florida broke the top 10 for agricultural exports, coming in at No. 8 with a $4 billion value. Learn more about Florida fruit and vegetable crops. Find Fresh From Florida recipes using the state's ingredients. 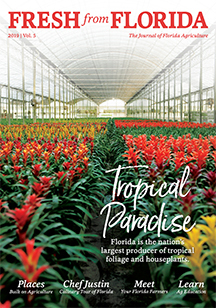 Florida's horticulture industry is the second-largest in the nation. Consumers can enjoy fresh, delicious produce from the state's many produce stands. 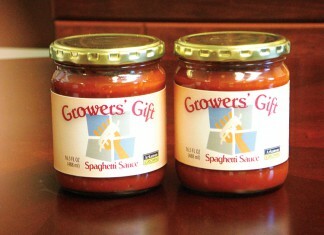 Schools across Texas serve locally sourced products.